The New Zealand helmet law came into effect from 1st January 1994. It applies to bicycle riders of all ages, but not to the riders of other types of cycle (unicycles, tricycles, quadricycles, etc). The NZ Government stated that the aim was to protect bicyclists from themselves, not from motor vehicle impacts. The fine for not wearing a helmet is NZD 55. However, if contested in court and found guilty, the fine can rise to NZD 500 with court costs of up to NZD 130 extra. Helmet use by adults rose from 43% to 92% as a result of the law. For teenagers aged 13-18 the rise was from 56% to 97%, and for younger children from 86% to 98%. By 2008, wearing rates by adults remained high at 93%, but had fallen to 90% for teenagers and 93% for younger children (NZMT, 2008). Helmet fitting and the replacement of old and damaged helmets is poor. Enforcement varies by region and the view of individual police officers. In some areas enforcement is rare while in others bicyclists report being stopped regularly. Every year or so some sort of 'blitz' campaign is launched, often at the start of the school or university year. Scale of convictions: unknown. In one case a judge refused to fine a bicyclist riding without a helmet on the grounds of de minimis (too minor an offence to justify the court's time), but by nature of the type of court this has not set a precedent. In 2006 it was reported that three-quarters of fatalities were still due to head injuries, although helmets were worn by 94% of cyclists (NZMT, 2007). From 2006 to 2009, hospital admissions stablised at approximately 300 to 340 cyclists per year. A review of cycling casualties (Tin Tin, Woodward and Ameratunga, 2010) found that the rate of injury had increased in the decade up to 2007, particularly in crashes not involving a motor vehicle, suggesting that more cycling was being done off-road. The rate of traumatic brain injuries had decreased, which is also consistent with less road cycling. No surveys to track cycle use were carried out to monitor the effect of the helmet law. However, the New Zealand Household Travel Survey (LTSA, 1993-7) shows that cycling decreased by approx 22% between 1993 and 1997. In 2006/7 Land Transport NZ said that cycling had declined from 3.6% to 1.8% of traffic over an unspecified period. Cycle trips had fallen by 39% overall, but by 50% for young people aged 5 to 20 years (Hammond, 2010). It is understood that earlier attempts to set up hire schemes in Porirua and Palmerston North in the 1990s foundered due to the helmet law. A cost-benefit analysis published in 2002 (Taylor and Scuffham, 2002) suggested that there had been a small net benefit from the law for children aged 5 to 12 years, a small disbenefit for children aged 13 to 18 years, and a large disbenefit for adult bicyclists (19+ years). The results were very sensitive to the cost and life of helmets, helmet wearing rates before the law, and the effectiveness of helmets in preventing head injuries. Thus the net benefit for younger children was primarily because wearing rates for this age group were already 87% before the law, so few new helmets needed to be purchased to comply with the law. The cost of helmets purchased prior to the law was not taken into account. The analysis has been further criticised for being optimistic in its assessment of head injury reductions and for assuming very low costs as result of people quitting cycling due to the law. Detailed analysis: Taylor and Scuffham, 2002; BHRF, 1237..
Robinson DL, . Costs and benefits of the NZ helmet law. .
Hammond L, 2010. Pedestrian and cyclist safety in New Zealand. Land Transport NZ . International Road Accident Database (IRTAD). OECD/ECMT. Striken bike scheme up for national award. New Zealand Herald, 15 November 2010. New Zealand crash cyclist factsheet, July 2007. Ministry of Transport. Cycle helmet wearing survey, 2008. Ministry of Transport, 2008..
Perry N, . The bicycle helmet legislation, curse or cure?. University of Canterbury. Presented to Cycling 2001, Christchurch..
Tin Tin S, Woodward A, Ameratunga S, 2010. 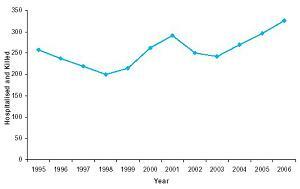 Injuries to pedal cyclists on New Zealand roads, 1988 - 2007. BMC Public Health 2010, 10:655.